Unilever Plc (UN.N) is dipping its toe into the cannabis space with one of its subsidiaries launching a CBD-infused product Tuesday, signalling a growing acceptance among major consumer goods companies to join the fast-moving marijuana market. 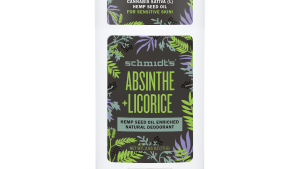 Schmidt’s Naturals, which was acquired by Unilever in December 2017 for an undisclosed sum, plans to release deodorant products that will infuse either hemp or cannabidiol, the non-impairing cannabis compound - as a key ingredient later this year. "CBD is probably the most powerful ingredient that we're going to see over the next decade in the personal care market,” said Michael Cammarata, chief executive officer of Schmidt’s Naturals, in a phone interview. CBD products have come into the spotlight since the 2018 U.S. Farm Bill was passed in December that allowed for inter-state commerce of hemp-derived goods, including the trendy compound. CBD can’t be efficiently pressed from hempseed but it can be extracted from the flower and leaves of the hemp plant, which is a variation of the cannabis sativa species. U.S drugstore chains CVS Health Corp. and Walgreens Co. recently said they would sell cannabis-related products in eight U.S. states, while a variety of U.S. and Canadian cannabis producers are striking deals to launch hemp or CBD products this year. Under Canadian law, CBD topical products won't be legal until this October. According to Cowen & Co., nearly seven per cent of Americans are already using CBD products, with the market forecast to rise to 25 million consumers who would spend a total of US$16 billion by 2025. But with a company like Unilever entering the space, the floodgates will likely open for other major consumer-goods companies to offer similar cannabis-related products, according to David Soberman, a marketing professor at the University of Toronto’s Rotman School of Management. "Only now that it’s becoming legal, there’s a lot of R&D and investigation going on trying to figure out how to properly market these products," Soberman said in a phone interview. The hemp versions of Schmidt’s Naturals deodorant will be available across the U.S. at Target Corp. stores in September, while the CBD version will be available soon in several U.S. states that have legalized marijuana, Cammarata said. CBD-infused deodorants are said to have antibacterial properties that help fight odour and include an anti-inflammatory to soothe irritation from shaving. Cammarata said that while Unilever allows Schmidt's Naturals to operate independently, the company assists its 400-odd subsidiaries with R&D, legal resources, distribution, and various supply chain issues. Unilever was "definitely part of the process" in launching its CBD product, Cammarata said. "They're working [to ensure] that we're in compliance with state and local laws." A Unilever representative was not available for an interview, according to a Schmidt’s Naturals spokesperson. Michael Garbuz, chief executive officer at Vision Advisory, a cannabis industry consultancy, said companies like Unilever view CBD as a "natural entry point" to enter the cannabis market while leveraging its existing retail and distribution infrastructure. "Every company wants to be on the cutting edge," Garbuz said in a phone interview. "Here's an opportunity to be a first mover in this market. Every board room in America is probably talking about cannabis right now."